0742 Birth: Charlemagne, first Holy Roman Emperor, 800-14. "Charles the Great (742-814), better known as Charlemagne, was crowned emperor of the Romans on Christmas Day, 800 by Pope Leo III. Charles was genuinely surprised. About three decades earlier, Charlemagne had begun his rise to power when he became king of the Franks (768). Through numerous military campaigns, he increased the size of his kingdom so that it included a large part of western Europe. He forced those whom he conquered to become Christians. Charlemagne waged war with the Saxons from 774-804. At one point, he threatened that he would kill all of the Saxons unless they became Christians...In the end, Charlemagne accomplished his goals. Missionaries were sent to the Saxons so that the conquered people could be instructed in their new faith. Charlemagne was not only a military man and ruler but also a reformer of both church and society..."
1550 All Jews are expelled from Genoa, Italy. 1796 Haitian revolt leader Toussaint L'Ouverture takes command of French forces at Santo Domingo. 1798 France's Revolutionary government sends Irishman James Napper Tandy, with the rank of brigadier-general, to Ireland to lead military moves against British rule. 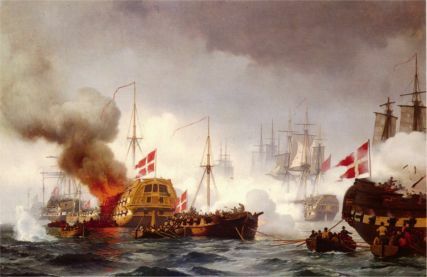 1801 Napoleonic Wars: The Danish fleet is destroyed by the British under Admiral Nelson at the Battle of Copenhagen. Ordered by signal flag to withdraw during the battle, Nelson puts a telescope to his blind eye and declares that he can see no such order. Note: This link is fascinating and definitive, and includes a narrative of the battle by Nelson himself. 1805 Birth: Hans Christian Anderson, Danish author. 1834 Birth: Frederic-Auguste Bartholdi, French sculptor; Statue of Liberty. 1840 Birth: Emile Zola, French novelist and activist. 1845 H.L. Fizeau and J. Leon Foucault take the first picture of the Sun. 1860 The first Italian Parliament meets at Turin. 1862 Birth: Nicholas Murray Butler, US educationalist, Columbia University president, pacifist, Nobel Peace Prize winner 1931. 1865 US Civil War: Confederate President Jefferson Davis and most of his Cabinet flee the Confederate capital of Richmond, Virginia, as General Grant breaks General Lee's line at Petersburg. 1865 Death: Ambrose P. Hill, confederate general, at 39, killed by a Federal Picket. 1866 US Civil War: President Johnson declares the war over in Alaska, Arkansas, Florida, Georgia, Mississippi, Louisiana, North Carolina, South Carolina, Tennessee and Virginia. 1872 Death: Samuel F.B. Morse, developer of the electric telegraph, in New York at the age of 80. 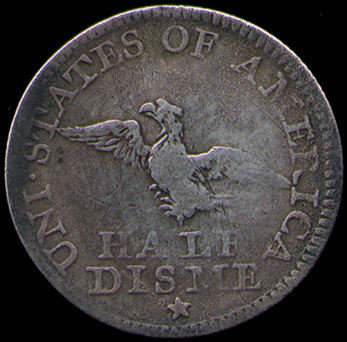 1872 G.B. Brayton, of Boston, Massachusetts, receives a patent for a gas-powered street car. 1875 Birth: Walter P. Chrysler, founder of Chrysler Automobile Company. 1877 The first Easter egg roll is held on the White House lawn. 1877 The first human cannonball act is performed at London's Amphitheatre, featuring acrobatic lady Zazal. 1889 Charles Hall patents aluminum. 1891 Birth: Max Ernst, French expressionistic surrealist painter and sculptor. 1896 Madison Square Garden in New York City hosts the season premiere of the Barnum and Bailey Circus, featuring a Duryea horseless carriage. 1902 The first motion picture theater opens in Los Angeles. The Electric Theater charges a dime to see an hours entertainment, including the films, The Capture of the Biddle Brothers and New York in a Blizzard. 1905 The Simplon rail tunnel under the Alps linking Switzerland with Italy officially opens. 1910 Karl Harris perfects the process for the artificial synthesis of rubber. 1914 The US Federal Reserve Board announces plans to divide the US into 12 districts. 1916 Prescott Bush, the father of future President George H. Bush, and Roland "Bunny" Harriman are chosen for membership in the elite Yale secret society known as Skull and Bones. 1917 US President Woodrow Wilson, reelected on the slogan 'He kept us out of war,' asks Congress to declare war on Germany. "...On the third of February last I officially laid before you the extraordinary announcement of the Imperial German Government that on and after the first day of February it was its purpose to put aside all restraints of law or of humanity and use its submarines to sink every vessel that sought to approach either the ports of Great Britain and Ireland or the western coasts of Europe or any of the ports controlled by the enemies of Germany within the Mediterranean. That had seemed to be the object of the German submarine warfare earlier in the war, but since April of last year the Imperial Government had somewhat restrained the commanders of its undersea craft in conformity with its promise then given to us that passenger boats should not be sunk and that due warning would be given to all other vessels which its submarines might seek to destroy when no resistance was offered or escape attempted, and care taken that their crews were given at least a fair chance to save their lives in their open boats. The precautions taken were meager and haphazard enough, as was proved in distressing instance after instance in the progress of the cruel and unmanly business, but a certain degree of restraint was observed. The new policy has swept every restriction aside. Vessels of every kind, whatever their flag, their character, their cargo, their destination, their errand, have been ruthlessly sent to the bottom: without warning and without thought of help or mercy for those on board, the vessels of friendly neutrals along with those of belligerents. Even hospital ships and ships carrying relief to the sorely bereaved and stricken people of Belgium, though the latter were provided with safe conduct through the proscribed areas by the German Government itself and were distinguished by unmistakable marks of identity, have been sunk with the same reckless lack of compassion or of principle. I was for a little while unable to believe that such things would in fact be done by any government that had hitherto subscribed to the humane practices of civilized nations. International law had its origin in the attempt to set up some law which would be respected and observed upon the seas, where no nation had right of dominion and where lay the free highways of the world....This minimum of right the German Government has swept aside under the plea of retaliation and necessity and because it had no weapons which it could use at sea except these which it is impossible to employ as it is employing them without throwing to the winds all scruples of humanity..."
1924 The Romanian-Russian negotiations fall apart. 1926 Birth: Michael Rizzello, sculptor, coin designer. 1932 Charles Lindbergh pays a $50,000 ransom for his kidnapped son. 1933 Church and Reich: The Catholic Worker's Movement declares its readiness to cooperate in the creation of a strong national state and the building of an order at once Christian and German. 1933 Church and Reich: Monsignor Kaas has a private talk with Hitler. 1934 Lithuania removes all Jewish doctors from government-run hospitals and clinics. 1935 Sir Watson-Watt is granted a patent for RADAR. 1939 The Nazis fail to win any seats in the Belgian House of Deputies. 1940 WW2: Hitler orders the invasion of Norway for April 9. 1944 WW2: The Soviet Union announces that its troops have crossed the Prut River and entered Romania, one of Germany's allied countries. 1947 The UN Security Council votes to appoint the US as trustee for former Japanese-held Pacific Islands. 1951 General Dwight Eisenhower assumes command of all allied armies in Western Mediterranean area and Europe. 1958 The National Advisory Council on Aeronautics is renamed NASA. 1960 France signs an agreement with Madagascar which proclaims the country an independent state within the French community. 1963 The USSR launches Luna 4, but it misses the Moon by 8,500km. 1964 The USSR launches Zond 1 to Venus, but no data is returned. 1966 The Soviet Union's Luna 10 becomes the first spacecraft to orbit the Moon. "Luna 10 was launched on 31 March 1966 and Luna 12 on 22 October 1966. They were the first Luna spacecraft intended to go into orbit around the moon, rather than soft or hard landing there. On 3 April 1966, Luna 10 was put into a selenocentric orbit -- becoming the moon's first man-made satellite. It had an apogee of 1015 km, a perigee of 350 km, an inclination to the equatorial plane of 72 degrees. The orbital time was 2 hours 58 minutes. The Luna 12 orbit was: apogee 1740 km, perigee 100 km, inclination 20 degrees, orbital time 3 hours 25 minutes. Both missions carried instrumentation to study the Moon and cislunar space. The instruments comprised a multichannel scintillation gamma-ray spectrometer intended to measure the moon's gamma- radiation. However, the Luna 10 and 12 spacecraft both measured the cosmic gamma-ray background during their flight to the moon." 1966 The Nam: South Vietnamese troops join in demonstrations at Hue and Da Nang for an end to military rule. 1970 Qatar gains independence from Britain. 1972 Israeli Prime Minister Begin visits Cairo, Egypt. 1972 Death: Franz Halder, Colonel-General and Chief of the General Staff of the German army (OKH) from September 1, 1938 until fired by Hitler on September 24, 1942. He was arrested by the Gestapo on July 21, 1944, and held in concentration camps until released by the Allies in 1945. 1974 Death: Georges Pompidou, French president, in Paris. 1987 Drivers are back in the fast lane as the US states begin to raise the speed limit on interstate highways in limited areas to 65 miles per hour. 1989 Haiti's military leader, General Prosper Avril, survives a coup attempt apparently sparked off by his US-backed efforts to clamp down on drug trafficking. 1990 President Saddam Hussein threatens to incinerate half of Israel with advanced chemical weapons if it joins a 'conspiracy' against Iraq. 1991 Price hikes of up to 200 percent on basic goods and public transport goes into effect throughout the Soviet Union, sparking widespread popular anger. 1992 Mafia boss John Gotti, nicknamed Teflon Don after emerging unscathed from previous trials, is convicted of the murder of Paul Castallanos, and of racketeering. 1995 Members of the extremist group Hamas accidentally set off a bomb that destroys their hideout in the Gaza Strip, resulting in the deaths of six people. 1996 Russia and Belarus sign a treaty that creates a tight-knit political and economic alliance within the Commonwealth of Independent States: the "Agreement on the Formation of a Community." 1996 Lech Walesa, the former Solidarity union leader who became Poland's first postwar democratic president, resumes his old job as an electrician at the Gdansk shipyard. 1999 The US Labor Department reports that America's unemployment rate is at a 29-year low of 4.2%.